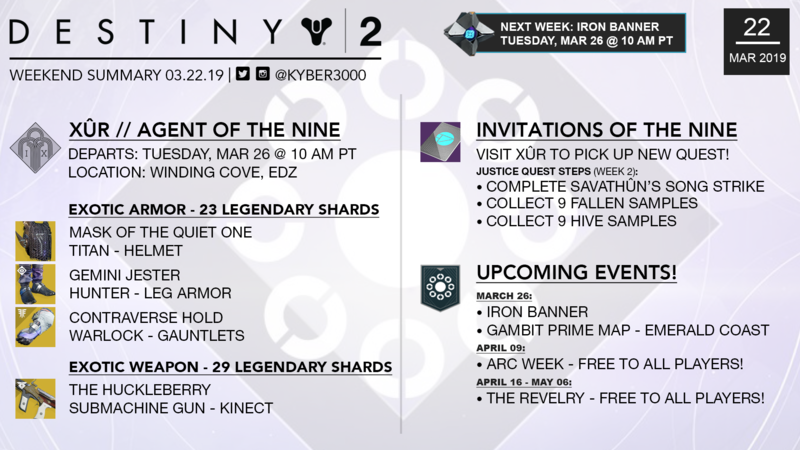 This weekend you can find Xûr hanging out at the Winding Cove, EDZ and a new Invitations of the Nine Quest is available. View Xûr’s inventory, news, and more below. Destiny 2. XUR FORSAKEN EXOTICS & BOUNTY! Xur Location/Loot March 15, 2019. Where is Xur 3-22-2019? by Mesa Sean on YouTube << Click link for more Destiny 2 videos! Earn bonus Valor in Crucible playlists. Emerald Coast will be the featured map in Gambit Prime.